Thanks for making contact. I’ve been in the plastic surgery “business” with my wife for about 7+ years at this point. I’m not sure this makes me any sort of expert, but I’m willing to try to answer your question and help. 2. 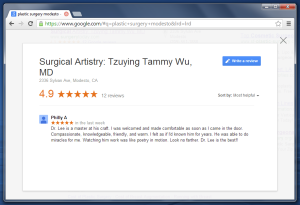 Sutter Plastic Surgeons – who also might want to explore new avenues. 3. Beverly Hills plastic surgeons – so competitive there – they might want to buy another practice. 4. Plastic Surgeons graduating from residency (ie. Stanford Univ.) – they might have rich relatives? The reason plastic surgeons would want to buy another practice is to get a foothold on Cosmetic surgeries. There’s a life cycle / phases of a plastic surgeon’s life. It usually starts with reconstructive surgery then moves on to cosmetic surgeries. So by buying another person’s practice, one would get a better footing (faster too) into cosmetic surgery. With insurances getting stranger and stranger these days – I think more plastic surgeons would want to move over to a cosmetic focused practice. However, that being said, I know a bunch of plastic surgeons who love reconstructive surgery and dislike cosmetics. Buying a cosmetic/plastic surgery practice, in my mind, is beneficial for buying the building, location, equipment, furniture, instruments, and perhaps reputation and possibly repeat patients if the new surgeon is introduced. Also from what I’ve seen, most plastic surgeons like to slowly grow their own practices; thus the era of buying medical practices is slowly going away. But I still definitely see the value of a seasoned surgeon mentoring a younger surgeon and introducing that person into the environment. When I was about to leave my previous general surgery practice in Modesto, CA, I was given an opportunity to join a well established general surgeon in Orange County, California. And with reimbursement arrangements, it would be similar to “buying” a practice. Good luck to you! Let me know how it goes. I just now read your blog and was facinated by the content. I think it is wonderful that you took the time to impart this information to others. I am a medical Practice Administrator and Physician Recruiter. I love what I do and I live in Medford, Oregon. I recently left my position as the Administrator of a three site Retina practice and am doing strictly MD recruitment. Could you give me a few pointers on the best places to look for a Plastic Surgeon seeking to buy a well established practice? I am on a mission because I need to fill this position by July 2014. Any assistance or guidance you could share would be greatly appreciated. This entry was posted in Uncategorized on November 16, 2013 by Calvin Lee, MD. Fibrin casts form, may be revealed with repeat bronchoscopy. Surfactant is diminished resulting in decrease in lung compliance. Pulmonary fibrosis and airway stenosis is a late finding. 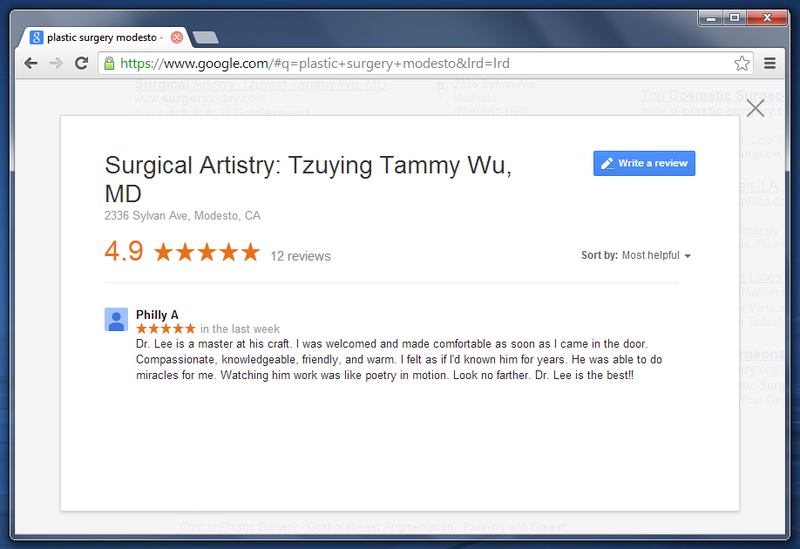 How is this related to our plastic surgical practice in Modesto, California? We need to be aware that inhalational injury exists. When working on the face, the risk of a surgical fire is present in the operating room when there are anesthetic gases which can be flammable. Oxygen is one of the main culprits for a surgical fire. There are precautions to take by the surgical team when a surgeon uses the electrocautery device on the face for any surgical procedure – including cosmetic mole removal. Consider evaluation by ENT colleagues. Bronchoscopy can be done as part of the evaluation by ENT specialists (Ear, Nose, Throat) – along with follow up to rule out or manage smoke and thermal related airway injury. A bronchoscopy could also be done by a General Surgeon colleague who has the experience. Inhalational injuries may require ventilatory support. I think inhalational injury and ventilatory health is something to consider with any burns which occurs on the face, even with what seems to be a short duration burn with a small area injured. This entry was posted in inhalational injury and tagged airway burns, bronchoscopy, Modesto, mole removal, surgical fires, ventilator on November 9, 2013 by Calvin Lee, MD. The other use of HYPERTONIC Saline is in the COSMETIC treatment of spider veins. Now it’s less popular for this indication because POLIDOCANOL has been shown to be a superior product for spider vein treatment (and more expensive), but safety and superiority trumps cost for the most part. We use Polidocanol at Surgical Artistry, in Modesto, CA. This entry was posted in Cosmetic Surgery, General Surgery, Modesto, Uncategorized and tagged hypertonic saline, spider veins on November 2, 2013 by Calvin Lee, MD.